To Cite: Khan F Y. A 21-Year Old Male with Hemoptysis and Central Chest Pain, Int J Infect. 2019 ; 6(1):e81744. doi: 10.5812/iji.81744. Introduction: The diagnosis of endobronchial tuberculosis (EBTB) remains a diagnostic challenge due to its protean clinical presentation and absence of radiographic findings in 20% of the cases. In this report, we described a case of EBTB in a man who was presented to the emergency department with chest pain and hemoptysis. Case Presentation: A 21-year-old man who was presented to the emergency department with a 3-day hemoptysis and central chest pain. His past medical history was not remarkable. Chest computed tomography and bronchoscopy were performed and the lesion was biopsied; EBTB was confirmed based on histologic and microbiological evidences. A daily regimen of four-drug antitubercular therapy (ATT) was initiated and the patient was discharged home to follow tuberculosis clinic monthly. During the last follow-up visit, the patient did not show any symptoms and the repetition of the physical examination was not remarkable. Investigations showed a negative smear sputum, normal chest X-ray, and Normal Respiratory Function test. Conclusions: EBTB is a variant form of tuberculosis infection with a nonspecific clinical presentation and often, undetectable AFB in sputum smears. The lesion can be detected early by chest computed tomography and bronchoscopy, and the prognosis is good if the disease is confirmed and treated early. Copyright © 2018, International Journal of Infection. This is an open-access article distributed under the terms of the Creative Commons Attribution-NonCommercial 4.0 International License (http://creativecommons.org/licenses/by-nc/4.0/) which permits copy and redistribute the material just in noncommercial usages, provided the original work is properly cited. Tracheobronchial tree TB infection with bacteriological and/or histologic evidences is defined as EBTB (1). It is a variant of tuberculosis infection with protean clinical presentation that varies from fever, dry cough, hemoptysis, and shortness of breath to the right middle lobe syndrome (1-4). Chest radiography is normal in 20% of cases and the diagnosis of bronchial involvement and evaluation of surgical procedures are more accurately performed by bronchoscopy and thoracic computed tomography (1). Since there is a high probability of developing bronchial stenosis, early diagnosis and prompt treatment are essential to prevent this complication. We herein report a case of a patient with an EBTB to increase the awareness of physicians for this uncommon form of tuberculosis. A 21-year-old male presented to the emergency department complaining of hemoptysis of 3 days duration. It was bright red and small in amount (one teaspoon full), associated with central chest pain. He denied fever, loss of weight, and night sweat. His past medical history was unremarkable. Family history was remarkable for tuberculosis, as his father was treated for tuberculosis two years ago. On physical examination, the patient was tachypnic but afebrile. His blood pressure was 120/80 mm Hg, heart rate was 68 beats/minute and respiratory rate was 29 breaths/minute. The oxygen saturation was 98% in the ambient air. The rest of his examination was normal. Laboratory studies showed the white blood cell count of 13300/µL; blood chemistry and coagulation profile were normal. The chest radiograph showed significant opacities with air bronchogram noted in the left mid and lower zones. 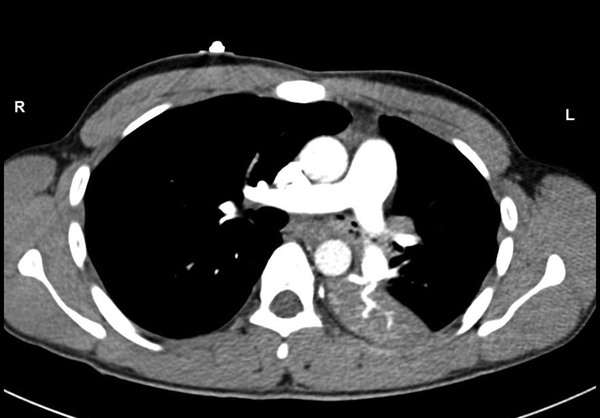 Chest CT showed mass obstructing the left main bronchus and left lower lobe opacity (Figure 1). There was no pulmonary embolism. Patient was admitted in the medical ward in respiratory isolation room. Sputum was sent for AFB, and TB culture. On bronchoscopy, macronodular endobronchial lesions where identified in the superior segment of the left lower lobe (Figure 2). Multiple endobronchial biopsies were taken from the segment along with brushing and bronchoalveolar lavage of the endobronchial wall. Pathology from the retrieved biopsies revealed necrotizing granulomatous inflammation, suggestive of tuberculosis. Two samples of sputum return negative for AFB, while TB culture remained pending. A daily regimen of four-drug ATT was initiated and the patient was discharged home to follow the tuberculosis clinic monthly. After one month, the patient was seen in the tuberculosis clinic, he showed marked improvement both clinically and radiologically following treatment with ATT, while M. tuberculosis was detected in the first two sputum samples. The patient was advised to complete six months of ATT and to visit the tuberculosis clinic monthly. On the last follow-up visit, approximately seven months after being discharged from the hospital, the patient had no symptoms and his physical examination was normal. Investigations showed negative smear sputum, normal chest X-ray, and Normal Respiratory Function test. EBTB is present in 18% of adult patients and 30% to 60% of children with PTB (5). Its diagnosis is challenging, due to its subtle and non-specific clinical presentation and the inability to detect acid-fast bacilli (AFB) by the sputum smear (6). The diagnostic yield of sputum AFB test varies from 16% to 53.3% (7). As noted, our patient was presented with hemoptysis and central chest pain while two sputum samples return negative for AFB. Although positive for M. tuberculosis, the sputum culture was obtained late after one month. Early recognition of the endobronchial lesions can be made by chest CT and bronchoscopy. Bronchoalveolar lavage (BAL), bronchial brush (BB), and mass biopsy are essential to establish the diagnosis rapidly. The samples should be subjected to smear acid-fast bacilli, polymerase chain reaction (PCR), and culture methods for isolation of M. tuberculosis, while biopsy should be additionally subjected to histopathology examination to detect caseating granulomas. The diagnostic yield of different methods varies; however, recent reports demonstrate the advantage of the real-time PCR detection of M. tuberculosis DNA in EBTB tissue biopsy over sputum, BAL, and BW smears at early disease stages (6). In our patient, chest CT and bronchoscopy played a central role in early diagnosis and prompt treatment of the case. The pathogenesis of EBTB is not yet completely understood, however, the suggested explanation includes erosion of a bronchial lymph node and lymphatic drainage from the parenchyma towards the peribronchial region, direct invasion of organisms from infected sputum or adjacent parenchymal focus, as well as hematogenous spread (2). Similar to pulmonary TB, the four-drug regimen is the first line ATT treatment of EBTB for the duration of six months (8, 9). There is controversy regarding the role of corticosteroids as adjunct therapy, however, some authors prefer to use these drugs in children or in EBTB with predominant hypersensitivity in its early stage (8). Prognosis is good if the disease is diagnosed and treated early. Our patient was diagnosed and received early treatment for six months. He showed a complete recovery clinically, radiologically and microbiologically following treatment with ATT and without steroids. Recognized complications include bronchoconstriction and stenosis that may occur in more than two-thirds of the patients despite being properly treated. Other complications include severe large airway obstruction with subsequent respiratory failure and bronchiectasis that leads to frequent pneumonia and hemoptysis (8). Interventional bronchoscopy can initially be tried for management of bronchial stenosis with various techniques; if these fail, surgical intervention is indicated (8, 9). In conclusion, EBTB is a variant form of tuberculosis infection that has protean clinical presentation and often undetectable AFB in sputum smear. Early recognition of the lesions can be made by chest CT and bronchoscopy. Prognosis is good if the disease is diagnosed and treated early. Conflicts of Interests: I declare that there are no conflicts of interest. 1. Kashyap S, Mohapatra PR, Saini V. Endobronchial tuberculosis. Indian J Chest Dis Allied Sci. 2003;45(4):247-56. [PubMed: 12962459]. 2. Kim EJ. A tuberculosis-associated endobronchial polyp that was negative for acid-fast bacillus. Intern Med. 2018;57(18):2701-4. doi: 10.2169/internalmedicine.9573-17. [PubMed: 29709958]. [PubMed Central: PMC6191598]. 3. Aneja A, Krishnaswamy UM, Thyagaraj V, Moideen RP, Satya Padmaja M. Endobronchial tuberculosis: Two case reports and review of the literature. Case Report Pulm. 2014;2014:1-4. doi: 10.1155/2014/283972. 4. Garg T, Gera K, Shah A. Middle lobe syndrome: An extraordinary presentation of endobronchial tuberculosis. Pneumonol Alergol Pol. 2015;83(5):387-91. doi: 10.5603/PiAP.2015.0062. [PubMed: 26379001]. 5. Chan KK, Ng DKK, Lau WF, Chow PY, Kwok KL. Endobronchial tuberculosis: A case report. HK J Paediatr (new series). 2005;10(1):59-61. 6. Hou G, Zhang T, Kang DH, Wang W, Hu XJ, Wang QY, et al. Efficacy of real-time polymerase chain reaction for rapid diagnosis of endobronchial tuberculosis. Int J Infect Dis. 2014;27:13-7. doi: 10.1016/j.ijid.2014.04.027. [PubMed: 25130617]. 7. Ozkaya S, Bilgin S, Findik S, Kok HC, Yuksel C, Atici AG. Endobronchial tuberculosis: Histopathological subsets and microbiological results. Multidiscip Respir Med. 2012;7(1):34. doi: 10.1186/2049-6958-7-34. [PubMed: 23088170]. [PubMed Central: PMC3488328]. 8. Shahzad T, Irfan M. Endobronchial tuberculosis-a review. J Thorac Dis. 2016;8(12):3797-802. doi: 10.21037/jtd.2016.12.73. [PubMed: 28149579]. [PubMed Central: PMC5227231]. 9. Idrees F, Kamal S, Irfan M, Ahmed R. Endobronchial tuberculosis presented as multiple endobronchial vesicular lesions. Int J Mycobacteriol. 2015;4(2):154-7. doi: 10.1016/j.ijmyco.2015.02.005. [PubMed: 26972885].